The Jaguar XJ-S (later called XJS) is a luxury grand tourer manufactured and marketed by British automobile manufacturer Jaguar from 1975 to 1996, in coupé, fixed-profile and full convertible body styles. There were three distinct iterations, with a final production total of 115,413 units over 20 years and seven months. Originally developed using the platform of the then current XJ saloon, the XJ-S was noted for its prominent rear flying buttresses. The styling was by Jaguar's pioneering aerodynamicist Malcolm Sayer — one of the first designers to apply advanced aero principles to cars. Sayer died just before the XJ-S body styling was frozen for production. In its final iteration produced from 1991 to 1996, was manufactured under Jaguar's new owner Ford, who introduced numerous modifications — and eliminated the hyphen in the name, marketing Jaguar's longest running model simply as the XJS. The XJ-S was introduced on 10 September 1975. The development, directed by William Heynes had begun in the late 1960s by the code name of project XJ27, with an initial shape penned by Malcolm Sayer, but after his death in 1970 it was completed by the in-house Jaguar design team, headed by Doug Thorpe. Power came from the Jaguar V12 engine with a choice of a manual or an automatic transmission, but the manual was soon dropped as they were left over from V12 E Type production. V12 powered production automobiles were unusual at the time; Italian luxury sports car makers Lamborghini and Ferrari produced such models. The specifications of the XJ-S compared well with both Italian cars; it was able to accelerate to 97 km/h (60 mph) in 7.6 seconds (automatic models) and had a top speed of 230 km/h (143 mph). The first series of XJ-S cars had a BorgWarner Model 12 transmission with a cast-iron case and a bolt-on bell-housing. In 1977, General Motor's Turbo-Hydramatic 400 transmissions were fitted. The TH400 transmission was an all-aluminium alloy case with an integrated non-detachable bell-housing. The XJ-S was originally supplied with Dunlop SP Super E205/70VR15 tyres on 6K alloy wheels; British police upgraded their Jaguars to a higher-performance 205/70VR15 Michelin XWX tyres. Jaguar launched the XJ-S in the wake of a fuel crisis, when the market for a 5.3-litre V12 grand tourer was small. The buttresses behind the windows were criticised at the time as German authorities feared these would restrict rearward vision, and refused to give the XJ-S, and the similarly designed Lancia Montecarlo, type approval — necessitating German XJ-S buyers to obtain road approval for each individual car on registration. Italian styling house Pininfarina introduced a 1978 concept car based on the XJ-S, called the Jaguar XJSpider; which did not see production. From July 1981, the XJ-S was renamed the XJ-S HE and received the new High-Efficiency V12 engine for much better fuel economy. With the Fire Ball combustion chamber designed by Swiss Engineer Michael May, power output was increased as a by-product to 220 kW (295 hp) or 196 kW (263 hp) in North America. At the same time, the XJ-S HE received changes to its exterior and interior (body-coloured trunk plinth in place of the standard previous black, new five-spoke (starfish) alloy wheels, chrome inserts on the upper part of the bumpers, burled elm inserts on dashboard and door cappings). In 1982, the new V12 XJ-S HE won first and second at the RAC Tourist Trophy race at Silverstone. In 1983, the new 3.6-litre Jaguar AJ6 straight-six (I6) engine was introduced along with a new convertible model called the XJ-SC. The coupé's rather small rear seats were removed in order to make space for the removable soft top, making it a 2-seat car. The XJ-SC was not a full convertible but was a fixed profile variant with a non-removable centre targa-type structure and fixed cant rails above the doors and fixed rear quarter windows. The six-cylinder cars can be identified by a raised bonnet center section. Between 1983 and 1987, the six-cylinder-engined cars were only available with a five-speed manual transmission (Getrag 265), with a four-speed automatic (ZF 4HP22) offered from 1987 onwards (along with improved fuel injection as used on the XJ40). The earlier, manual models were not imported by Jaguar into the United States, which had to wait until the facelift manual 4-litre XJS coupé and convertible became available. A V12 powered XJ-SC was introduced in 1985. From 1986, a full convertible version was available through some dealers, modified by Hess & Eisenhardt in the USA. The Hess & Eisenhardt coachbuilding firm was located in Ohio, USA, and built about 893 of these cars under contract from Jaguar before the official Jaguar-built XJS full convertible became available in 1988. The Hess & Eisenhardt convertible differed from the later Jaguar-built XJS concertible as its unpadded top folded down deeper into the body structure of the car resulting in a cleaner rear profile when the roof was lowered. To accommodate this design element, the Hess & Eisenhardt convertibles have two separate fuel tanks, positioned to allow for the roof to fully retract. The process of converting the stock Jaguar XJS coupé into the H&E Convertible included the post-production removal of the roof, cutting the body in several sections, the addition of steel reinforcements behind the driver's seat, and 9.1 kg (20 lb) weights placed just behind the headlights to eliminate harmonic resonance caused by the significant modifications to the car. H&E XJS convertibles are easily identified by the lower folding top, as well as two small badges located just behind the front wheels. The later Jaguar full convertible had a heavier padded top that did not fold as lower as the H&E convertible, but retained nearly all of the original components of the coupé. The number of H&E Jaguar XJS produced is unknown, partly because a fire at the Hess & Eisenhardt factory destroyed most of the records pertaining to the Jaguar XJS conversions. According to some sources, a total of 2,100 cars were converted. From 1988 to 1993, a special high performance XJR-S version equipped with the 5.3 litres (5,344 cc) HE V12 engine was produced by the newly formed JaguarSport, a separate company owned in a ratio of 50:50 by Jaguar and TWR Group Limited specialising in developing high performance Jaguar sports cars. The car had a distinctive body kit, special alloy wheels, a unique suspension system utilising modified coil springs and Bilstein shocks, a luxurious interior with Connolly Autolux leather along with walnut wood trim, and handling improvements. The first 100 of these cars were named "Celebration Le Mans" to commemorate Jaguar's 1988 win at the 24 Hours of Le Mans and were only sold in the UK. Between 1988 and 1989, a total of 326 XJR-S cars were produced with the 5.3 litres (5,344 cc) engine which has a power output of 237 kW (318 hp). After September 1989, the displacement of the engine was increased to 5,993 cc (6.0 L) and it was now equipped witb with Zytek fuel injection and engine management system. This was different from the standard 6.0-litre engine used in the late XJS models and was unique to this model. The power output was raised to 249 kW (334 hp) at 5,250 rpm and 495 N⋅m (365 lb⋅ft) of torque at 3,650 rpm due to a higher compression ratio of 11.0:1, a new forgedsteel crankshaft, increased bore and forged alloy pistons. A modified air intake system and a low loss dual exhaust system was also standard on the model. The engine was mated to the 3-speed GM400 automatic transmission utilising a recalibrated valve body and had faster shift times. The car was equipped with Dunlop D40 M2 tyres for better grip. These modifications resulted in a top speed of 260 km/h (160 mph). During a comparison test conducted by Motorsport magazine in 1997, the XJR-S outperformed the other competitors which included a BMW 850i, Porsche 928 GT and a Ferrari Mondial. A total of 787 coupés and 50 convertible cars were built for the world market. In the United States, to commemorate the XJ220 launch in 1992, a limited number of 100 XJR-S coupes and convertibles were produced for the American market only. These included 22 Signal Red coupes, 22 Signal Red convertibles, 22 Jet Black coupes, 27 Jet Black convertibles, 2 Flamenco Red coupes, and the Silver Frost 'Press Cars' of 4 coupes and 1 convertible. Jaguar considered a luxury Daimler version to be marketed as the Daimler-S, notably without the buttresses and with only a single prototype built in 1986. Paul Banham did produce some custom notch back coupés without buttresses, larger rear side windows, and a narrow C-pillars. In the mid-90s, Banham also made a re-worked version called the XJSS based on the XJS. The XJS was re-launched in its final form in May 1991 under Ford Motor Company's new ownership, as a division of its Premier Auto Group. Ford dropped the model name's hyphen, marketing it as the XJS. The rear side windows appeared enlarged despite having identical glass apertures as the earlier cars, and the buttresses remained, minimised by the new side window trim. Designer Geoff Lawson noted the buttresses were part of the car's character. The car received a new 4.0-litre version of the AJ6 straight-six engine. In 1992, a convertible model having the same engine was added to the range. The V12 engine's capacity was enlarged to 6.0 litres in May 1992 and it had a power output of 227 kW (304 hp). Outboard rear brakes replaced the more complicated inboard brakes of previous models. With the introduction of the 6.0-litre V12, the transmission was also updated to a GM 4L80E with a fourth-gear overdrive, whilst the automatic 4.0-litre models continued with the electronic ZF4HP24E transmission. A 2+2 convertible was also introduced, as was a customised insignia line. At the same time, the car received more aerodynamic front and rear bumpers. In April 1994, substantial revisions were made to the 4.0-litre AJ6 engine and it was given a new name of AJ16, now equipped with coil-on-plug ignition. In 1995, the final specification changes were made and the car was referred to as the Celebration model to celebrate the 60th year of Jaguar Cars. Celebration cars feature diamond turned wheels, Jaguar embossed seats and a wooden steering wheel. A number of XJS's were modified by coachbuilders Lynx to create a three-door shooting brake, marketed as the Lynx Eventer. Records suggest that 52 pre-facelift XJ-S, and 15 post-facelift XJS, were adapted, with 18 being left hand drive and 49 being right hand drive. In 1986, a newly formed Lister Cars under the leadership of engineer Laurence Pearce began offering a high performance package for the Jaguar XJS. The cars were sold as Lister-Jaguar and 90 customer cars in total were converted. Lister teamed up with two manufacturers namely WP Automotive and BLE Automotive to carry out the conversion process. The standard package included increased engine displacement to 7.0-litres, a modified fuel injection system with four additional injectors and throttle bodies, larger engine valves along with connecting rods manufactured by Cosworth, a new crankshaft, new cylinder heads, new inlet and exhaust valves, new bearing caps, and a new body kit featuring a spoiler at the rear with a modified rear light clusters and flared wheel arches to accommodate the wide tyres. The modified suspension system featured Koni dampers having 30% stiffer rebound than the original and having a modified rear subframe arrangement with wishbones and radius arms relocated to provide greater triangulation and reduce axle tramp. The new shocks were 100% stiff at the front and 50% stiff at the rear. The braking system had ventilated brake discs and were moved outward for better cooling and stability. The interior was also modified and now had Recaro racing bucket seats and a new steering wheel with optimised feedback. The modified engine was rated at 370 kW (496 hp) and 678 N⋅m (500 lb⋅ft) of torque. The engine was mated to a 5-speed Getrag manual transmission. The cars were fitted with 17-inch wheels with wide Pirelli tyres measuring 10-inch at the front and 13-inch at the rear. Performance figures include a 0-97 km/h (60 mph) acceleration time of 4.5 seconds and a top speed of 322 km/h (200 mph). Some customers further got their cars modified with the addition of the LeMans package. The package included a 6-speed Getrag manual transmission, a new exhaust system and twin-superchargers over the standard package applied in order to extract a power output of 450 kW (603 hp) from the engine. In April 1979 a Jaguar XJS driven by Dave Heinz and Dave Yarborough was entered into Cannonball Baker Sea-To-Shining-Sea Memorial Trophy Dash, widely known simply as the Cannonball Run. They completed the 4,608 kilometres (2,863 mi) from New York to Los Angeles in a record time of 32 hours and 51 minutes, a record that stood for 4 years, until it was beaten by David Diem and Doug Turner in a Ferrari 308. Diem and Turner covered the same distance in 32 hours and 7 minutes on the US Express, an unofficial successor to the Cannonball Run. 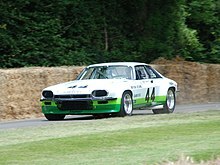 In 1982 Tom Walkinshaw's TWR had entered a team of the V12 XJS' into the European Touring Car Championship, the cars built to the FIA's Group A touring car rules. The XJS won its first race that season when Walkinshaw and Chuck Nicholson won the XIV Grand Prix Brno, the cars simply proving too fast for their rival BMW 530/530i and Alfa Romeo GTV6 opposition with Walkinshaw qualifying 5.37 seconds faster than anyone else on the 10.925 km (6.789 mi) Brno Circuit. After more victories for the teams Jaguars in 1983 (including lapping the 20.81 km (12.93 mi) Nurburgring Nordschleife circuit in 7:56.00), the TWR Jaguars were the cars to beat in the ETCC, with Walkinshaw claiming the 1984 ETCC Drivers' Championship. During the championship season the TWR Jaguar team also won the prestigious Spa 24 Hours race with an XJS driven by Walkinshaw, Hans Heyer and Win Percy, proving not only the speed of the cars, but the reliability of the 5.3 litre V12 engine. By 1984 the TWR Jaguars had a new challenger in the ETCC. The turbocharged Volvo 240T run by Eggenberger Motorsport arrived on the scene and had the speed to match the V12's, though with turbocharging new to touring car racing it took a number of races for reliability to match the cars speed. By the end of 1984, the TWR developed V12 engines in the XJS were rated at approximately 336 kW (451 hp). 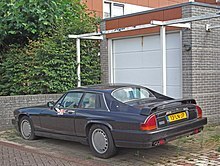 By 1985, the XJS had been retired from European competition and TWR was committed to running the 3.5L V8 Rover Vitesse in the ETCC. 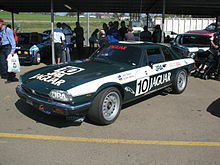 Walkinshaw had been to the 1984 James Hardie 1000 at the Mount Panorama Circuit in Bathurst, Australia, to co-drive a locally developed Australian Group C XJS with Australian driver John Goss. Walkinshaw qualified in provisional 7th place with a 2:16.09 lap of the 6.172 km (3.835 mi) circuit, recording a top speed of 290 km/h (180 mph) on the 2 km long Conrod Straight, with the promise of more to come in the "Hardies Heroes" Top 10 runoff through the use of special tyres. However, the tyres failed to arrive at the circuit in time and Walkinshaw eventually qualified 10th having to use front wheels on the car as no suitable rubber was available. Clutch failure saw the car fail to get off the start line and a helpless Walkinshaw was hit from behind by a Chevrolet Camaro Z28, causing the car's instant retirement and the race's first ever restart after the track was blocked at the start/finish line. The TWR XJS Jaguars were next seen late in 1986 at the Fuji 500 in Japan in what was meant to be its Group A swansong as it ran out of FIA homologation in at the end of the year. Against old foes in the BMW 635 CSi and Volvo 240T, as well as newer Group A cars such as the Australian Holden VK Commodore SS Group A V8 and the turbocharged Nissan Skyline DR30 RS, Walkinshaw qualified the XJS on pole, proving how competitive the car could still be in Touring car racing (the cars had been entered in the 1986 Bathurst 1000 and had undergone testing and development which gave a reported an extra 37 kW (50 hp), though the car ultimately did not race due to a lack of funding from Jaguar Rover Australia to help with freight costs). The Fuji race saw the Walkinshaw/Percy car lead the race until retiring on lap 6 with no oil pressure after easily holding off the 313 kW (420 hp) Holden Commodore of Peter Brock on the circuits 1.5 km (0.93 mi) main straight, while the Hahne/Denny Hulme/Walkinshaw car only lasted until half distance before retiring with a broken differential. 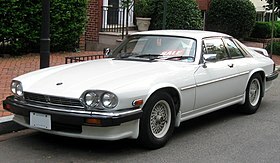 The XJ-S was featured prominently in the television series The New Avengers and Return of the Saint. A Hongkong film, The Bodyguard from Beijing, also featured two Jaguar XJ-S'. The original coupe was modelled by Corgi Toys. ^ LaChance, David (August 2013). "Forlorn Feline – 1988 Jaguar XJ-S Convertible". Hemmings. Retrieved 11 April 2019. ^ Fitzgerald, Craig (July 2009). "1993 Jaguar XJR-S". Hemmings. Retrieved 11 April 2019. ^ Frankel, Andrew (December 1997). "Jaguar XJRS". Motorsport Magazine. Retrieved 11 April 2019. ^ Lewis, Corey (1 February 2018). "Rare Rides: The 1993 Jaguar XJS, Which Is Actually an XJR...S". The Truth About Cars. Retrieved 11 April 2019. ^ a b "7.0-litre Lister-Jaguar XJS LeMans Coupé Powerslides To Auction". Autoweek. 6 February 2015. Retrieved 16 April 2019. ^ Culmer, Kris (12 July 2018). "Throwback Thursday: 1989 Lister XJ-S first drive". Autocar. Retrieved 16 April 2019. ^ "How Lister turned the XJS into a Ferrari-beater". Classic Driver. 28 November 2014. Retrieved 16 April 2019. ^ "Crouching Tiger - Lister-Jaguar XJS Le Mans". CarThrottle. Retrieved 16 April 2019. ^ "1986 Japan Gr.A Inter TEC opening laps (Japanese commentary)". YouTube.com. 31 January 2008. Retrieved 6 January 2017. ^ "Jaguar XJ-S in "Chung Nam Hoi bo biu"". IMCDb.org. Retrieved 15 April 2019.